Russian defence ministry also said that an Il-20 aircraft with 14 people on board disappeared from the radars of aviation control during an attack of four Israeli F-16 aircraft on Syrian targets in the province of Latakia. 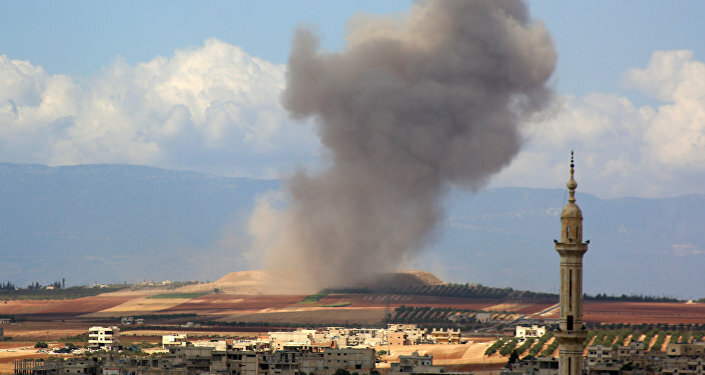 Earlier in the day, Russia and Turkey reached an agreement over a partial demilitarization of the Idlib province, which is the last remaining stronghold of anti-government insurgency and al-Qaeda-linked terror groups in Syria. On Monday evening, local media reported a missile attack by an unknown force on Syria's coastal city of Latakia. A source told Sputnik that there were drones and missiles involved. Another source from Syrian military said that the missile attack on Latakia was made from the sea.